IMAT is a HIPAA-compliant solution that enables clients to perform full-content data aggregation, normalization, storage, and analysis of ALL data, regardless of source or type, from across the continuum of care. 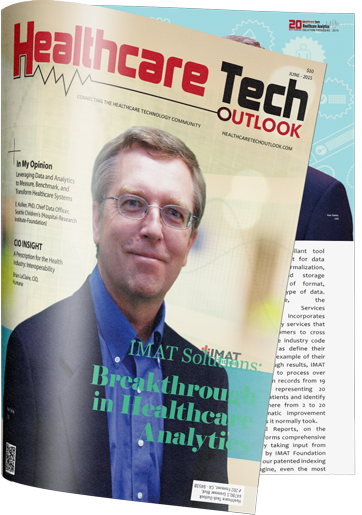 IMAT delivers real-time insights and access to a true 360-degree view of all data and is key to addressing the big data and interoperability challenges faced by Healthcare organizations today. IMAT Foundation Services: Able to aggregate and normalize data from across the continuum of care, IMAT Foundation Services enables a patient-centric, 360-degree view of all healthcare data. This capability ensures that all relevant patient data, regardless of the source or type, is taken into consideration when making decisions regarding patient care, population management, quality initiatives, and more. This expands the boundaries of information from single records or episodes of care to include all records across time, locations, and providers. IMAT Query Builder: IMAT Query Builder enables real-time cohort identification across large and diverse patient populations. This interactive user interface provides the ability to monitor and track cohorts over time to determine if the correct prevention and treatments are being delivered, and determine if the expected outcomes are achieved. IMAT Clinical Reports: IMAT Clinical Reports is a business intelligence solution that provides healthcare organizations with the technology to improve patient outcomes by monitoring clinical performance. It puts up-to-date clinical information in the hands of clinicians to improve patient outcomes, ensure compliance with guidelines and reduce the overall cost of healthcare.IMAT Clinical Reports also provides accurate and relevant information to support all institutional, Federal, State, and industry reporting mandates. These include, but are not limited to, PQRS, Core Measures, HEDIS, NQF, and UDS reporting. Additionally, this module enables users to create custom queries and reports to support care coordination, cost of care monitoring, cost/efficiency measures, and risk identification, to name a few sample applications. IMAT Clinical Reports also provides interactive charts and graphs to facilitate OLAP-type data analysis. Perfect Search was formed in 2007 to develop the world’s fastest, most accurate search technology. The IMAT Solutions℠ division was formed to combine this patented search technology with innovations in the medical industry. IMAT is composed of a selection of modules that allow organizations to tailor the product to their needs.